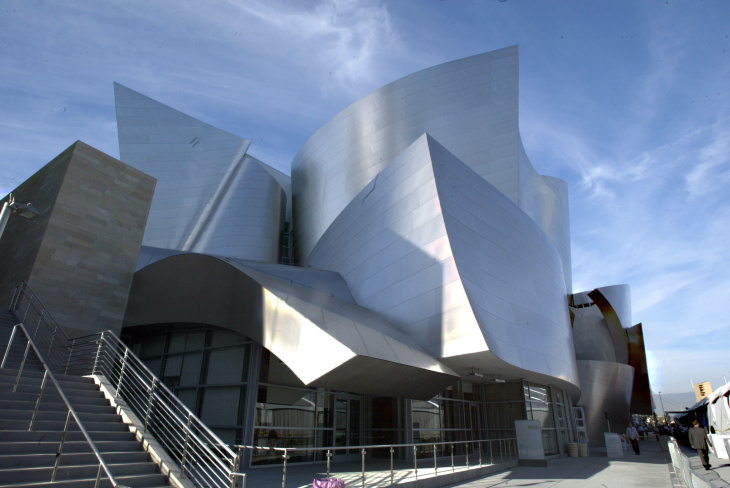 File: The Concert Hall exterior at the Walt Disney Concert Hall opening gala, day one of three, Oct. 23, 2003 in Los Angeles. The LA. 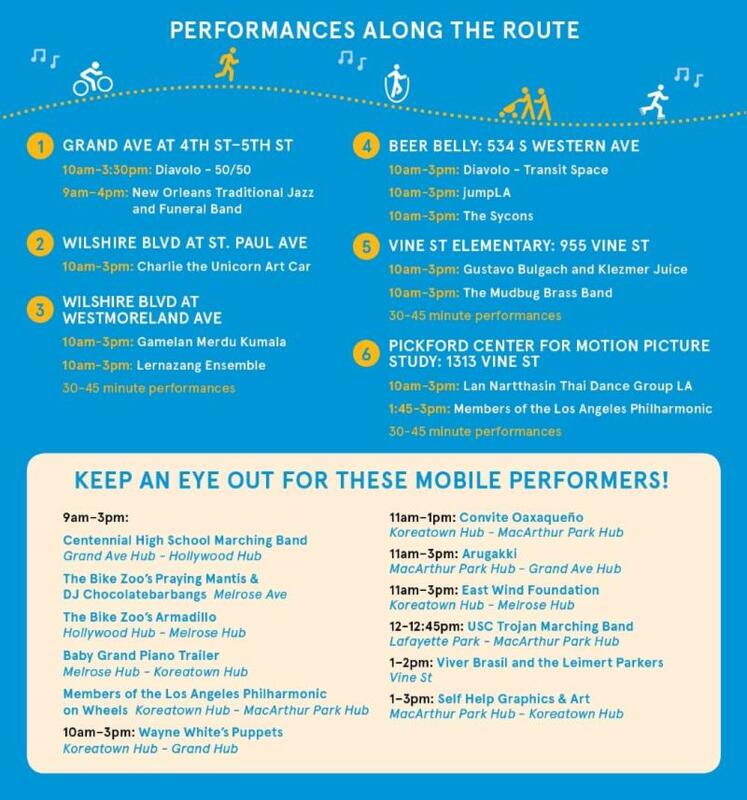 Philharmonic is kicking off its 100th year by joining forces with CicLAvia this Sunday, Sep. 30, to host Celebrate L.A., a massive street party that stretches from Disney Hall in downtown L.A. to the Hollywood Bowl — where the festivities culminate with a free concert. Those tickets are long gone but you can still join the eight-mile open-air celebration or figure out which 'hoods to avoid. Starting at 9 a.m., streets will be closed to cars. Bicyclists, walkers, skateboarders and maybe a few unicyclists will roll through the city, enjoying the performances, art, food trucks and scenery. Nearly 1,800 musicians, artists and dancers will be performing at six hubs along the route. Did we mention how massive this is? So even if you can't get into the Hollywood Bowl show, there are plenty of other entertainment options. The festivities kick off at 8:30 a.m. with a ceremony outside Disney Hall, followed by a marching band procession. Notable performers include Ozomatli, Wynton Marsalis with the Jazz at Lincoln Center Orchestra, Jeff Goldblum and Weezer's Rivers Cuomo with members of the L.A. Phil. Melrose Ave. at North Windsor Blvd. Vine St. between Hollywood Blvd. and Yucca St. The celebration even has its own official app. The lineup for Celebrate L.A.
Grand Ave. between 1st St. and Wilshire Blvd. Wilshire Blvd. between Grand Ave. and Western Ave.
Western Ave. between Wilshire Blvd. and Melrose Ave.
Melrose Ave. between Western Blvd. and Vine St.
Vine St. between Melrose Ave. and Yucca St.
Highland Ave. will remain open, with shuttle service connecting the Hollywood Hub and the Hollywood Bowl. 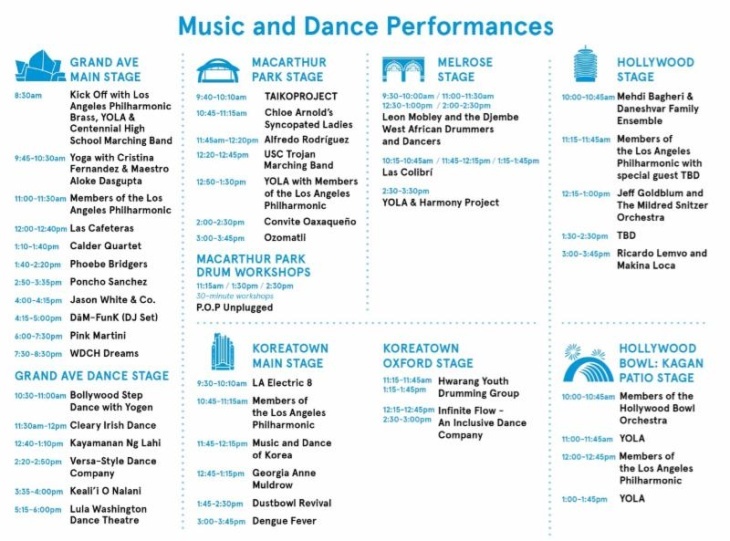 Most streets will start reopening at 4 p.m., although some events continue at the Grand Avenue Hub until 8:30 p.m.
For those of you lucky enough to land tickets for the Hollywood Bowl show, the L.A. Phil's Music & Artistic Director Gustavo Dudamel is leading the L.A. Phil in a concert with special guests including Katy Perry and Herbie Hancock. There's more than just Sunday. The events started yesterday and will last through next Thursday, Oct. 4. One of those other events includes WDCH Dreams, a visualization based on 45 terabytes of the orchestra's archives, intended to give the feel of seeing the venue's dreams. Forty-two large-scale projectors will display 3D "data sculptures" onto the building's exterior, running nightly from 7:30 to 11:30 p.m. Friday, Oct. 5 until Saturday, Oct. 6. You have your chance to celebrate with the L.A. Phil all week, but especially this Sunday. Their season officially kicks off Thursday, Oct. 4.